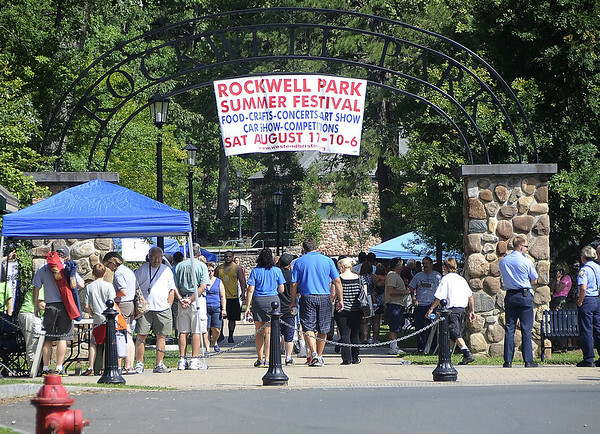 BRISTOL - Bristol’s West End Association is hosting its seventh annual summer festival at Rockwell Park Saturday. Admission is free to the festival, which begins at 10 a.m. and will include bands and musical performances, art exhibits and demonstrations, a Kids’ Zone interactive play area, dance performances, crafts, food, an antique car show and basketball and skateboard tournaments. David Hamelin, president of the West End Association, said the festival is intended to showcase and celebrate Bristol’s West End, its merchants, its organizations and its residents. On hand will be 100 vendors, artists, paddle boats, 10 restaurants and four food trucks. Hamelin noted that a dozen volunteers from Bristol Eastern High School’s Performing Arts Booster Club will be lending their time to help make this a fun day for the community. The Imagine Nation Kids’ Zone, sponsored by the NAACP & Bridge Community Church, will feature inflatable bounce houses, relay courses, games, competitions, face painting and a train that travels across the fields. The Bristol Auto Club will host an open car show and a free drawing will be held for door prizes. The festival’s popular pie-eating contest, sponsored by Harvest Bakery, will be held at 3:14 p.m. with competitions for children and adults. Athletic competitions will include a three-on-three basketball tournament and a skateboard competition sponsored by Biker’s Edge. Sixteen musical acts will perform on the festival’s two stages. Confirmed so far are Get Up and Dance, Bridge Worship, G-Rockwell and the Still River Gamblers, The Long Road Back, Jason Gerrish, Gypsy Jo, Jim Moore, Woof, Wolf Tone, Inner Groove and Voices of Heaven. New to this year’s festival will be Cigna’s mobile health care lab, offering free blood pressure, cholesterol and body mass index tests. There will be ample on-site parking. Additional parking will be available at the Dollar General parking lot on Divinity Street. Shuttle busses will run throughout the day. Festival sponsors include Thomaston Savings Bank, Bristol Hospital, Barnes Group Foundation, Wheeler Clinic, Bristol All Heart, Hartford HealthCare, Riverside Investments, Carrier Construction, Riverview Apartments, Minuteman Press, the Bristol Republican Town Committee and Direct Advantage Magazine. For more information, visit facebook.com/WestEndAssociation, call Hamelin at 860-583-3292 or email him at westendbristol@gmail.com. Posted in The Bristol Press, Arts, Bristol on Tuesday, 14 August 2018 21:33. Updated: Tuesday, 14 August 2018 21:35.